The following statistics and insights are excerpts from the IBM Institute for Business Value (IBV) Global C-suite Study (19th edition). IBM’s latest worldwide study draws on input from 12,854 respondents across 6 C-suite roles, from 112 countries. The C-suite is evenly divided on whether the focus in the future will shift from established markets to new ones. In two areas, however, C-suite executives stand in close agreement: how they will change their value propositions and scale their value chains. Sixty-eight percent of C-suite executives expect organisations to emphasise customer experience over products. Sixty-three percent believe that most organisations will continue to expand their network of business partners. IBM IBV applied cluster analysis to identify distinct segments of organisations among the study participants. Three archetypes emerged: the Reinventors, the Practitioners and the Aspirationals. The organisations clustered within these archetypes are at different stages of their Digital Reinvention. 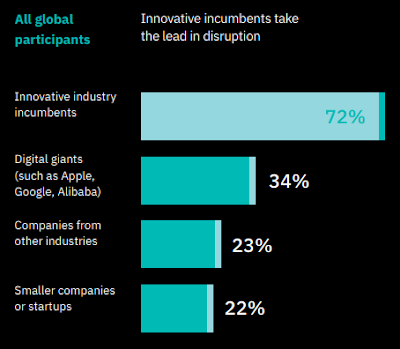 The Reinventors (27 percent of the total) are the market leaders. They outperformed their peers in both revenue growth and profitability over the past three years, and also led with innovation. Their organisations are exceptionally well aligned. Their IT strategy is in sync with their business strategy and they’ve optimised their business processes to support their strategic initiatives. Practitioners (37 percent of the total) haven’t yet developed the capabilities to match their ambitions. But they say they’re ambitious. Over half of the Practitioners plan to launch new business models within the next few years. The Aspirationals (36 percent of the total) have a long way to go in both their digital journey and their ability to move quickly to seize new opportunities. They’re the most exposed to disruption. That being said, thirty-six percent of C-suite executives report little or no impact from disruption in their industries. Forty-four percent say they don’t see any urgency to transform their enterprises in response to disruption. In all, just 27 percent say they’re experiencing significant disruption. According to the IBM IBV study findings, the surge of competition from other industries didn’t happen at the anticipated scale. Only 23 percent of C-suite executives say that competitors from outside their industry are a significant source of disruption. Seventy-two percent of C-suite executives say that innovative incumbents lead the disruption in their industry. Even in industries with higher than average turmoil, such as financial services, where startups have a relatively larger presence, innovative incumbents drive the most change. Reinvention never ends. As new opportunities emerge, the organisations that remain open to change can orchestrate advantage. These evolutionary changes include new trusted bonds with customers, new ventures to scale on platforms, and more nimble teams. Invest for new growth. Create market-shaping and capability building investments that inject innovation, new talent and technologies into your enterprise. Acquire these if necessary; grow them organically if your enterprise is agile enough.